Can you guess what this is a photo of? 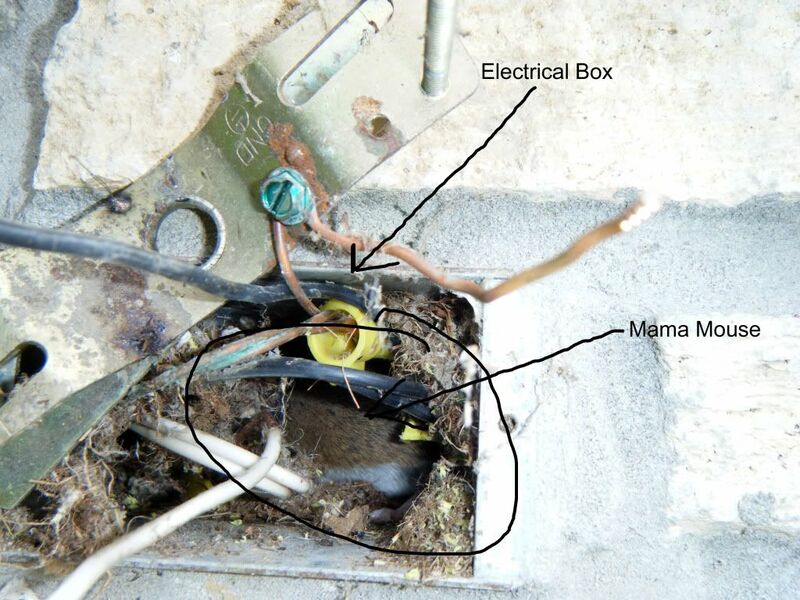 If you guessed a mouse in an electrical box you guessed it! We seem to be cursed with mice these days. I'm actually relieved though that it is only mice and that it was an inexpensive fix. Two days ago we had some friends from church over and as they were leaving all the lights in the entry inside and out and the dining room went out. We assumed it tripped a breaker, so we got a new one only to discover that it wasn't the problem. I started worrying about huge electrician bills. Haldan gave it a couple hours this morning and after pulling the lights off he found the culprit... a mouse nest with babies and a mama mouse. I've learned that mice must be good climbers and they can live in exptremely small spaces. I guess we should have replaced that bulb sooner. Haldan managed to get the babies out, but when it came to getting the mama mouse out he refused unless I let him stab it with a screw driver. I was dripping wet, just out of the shower when Haldan came in to report. I didn't want him to stab the mouse, so I got dressed and headed out to save it from a painful death. It took a good 15 minutes, but she finally came out and then flew out of my hands 6 feet up on the ladder and ran away as fast as possible. We caught her once more only to learn our net had a hole. She was one fast little thing. I'm hoping she doesn't make another home in our lights or near the house. I'm a little sad that I've broken up 2 mouse families now. I just can't have them eating through all my wires and wire nuts. Here's a labeled version of the same picture if you couldn't see it before. Once I got all the nest out it was easier to see her and get to her, but she kept getting caught in the wires. Here's a short clip to enjoy. You can pause the music on bottom of screen to hear it better. So funny you little homewrecker you C: I think it comes with living in Cedar Rapids Just another reason you need to move closer to me :D!! You are brave though to do that You couldn't have paid me to put my hand in there! Loved the video. That's hilarious. You are VERY brave and you look so cute with your little hat on. I hope that you don't find too many more mice family living with you. The video was really funny. Oh! I thought I commented already, but apparently not. The kids and I watched your video two or three times. Its so funny, and you are Seriously SO Brave!! I'd be so squirmy the whole time scared that I'd squish the thing! Although, I know what you mean about saving the momma from a horrible death.